King of Fruits, the true test of a fruitphile, a delicacy, Durian is an assault on the claim of all other fruits to their categorization, and it only grows in Southeast Asia. The fruit is most notable for its pungent smell that has been compared to rotting flesh, and heaven. The odor is so abrasive it is banned from confined public spaces like airplanes and hotels. Traveling through Lombok with my German friends, I had to bribe the hotel reception staff to let us bring in our feast. They’re not easy to hide. A durian fruit is roughly the size of a human head and covered in spikes that actually pierce the skin. They are opened in segments with seeds growing in the compartments between. The fruity flesh surrounds seeds similar to a mango and can have a similar texture: creamy or hard depending on how long you can wait to eat it. I tend to prefer them a little ripe so the texture is soft, but not too much otherwise they become durian manis (sweet durian) and I prefer the flavor when it’s still pahit (bitter). At first they don’t look particularly appetizing. The fruit covered seeds somewhat resemble large maggots resting peacefully in the bowels of this spike ball. The taste can be overwhelming. 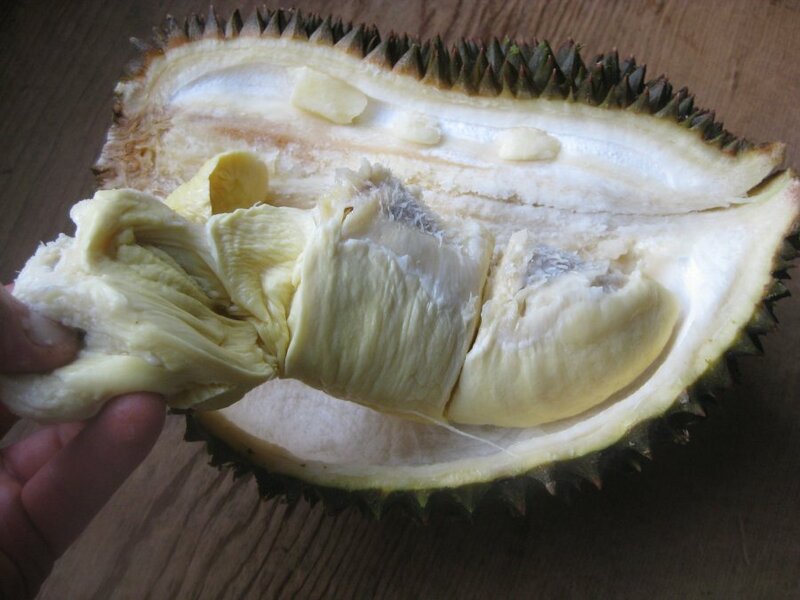 Most people can barely finish one seed their first time and a single durian usually has 3-5 compartments shielding 2-4 seeds each. At first you are hit with an extreme bitter and I think oniony taste. The after-taste lingers and your hands are rewarded with a hint of durian for an hour or two. Why would anyone eat this fruit? I love it. Most people in Indonesia love it, but only eat it rarely because it tends to be expensive. In a place where an average dinner costs $0.70 paying $5.00 for a fruit seems a bit ludicrous. But we can’t help it. Many Westerners will say they came, they tried, they hated. It’s just not for them. 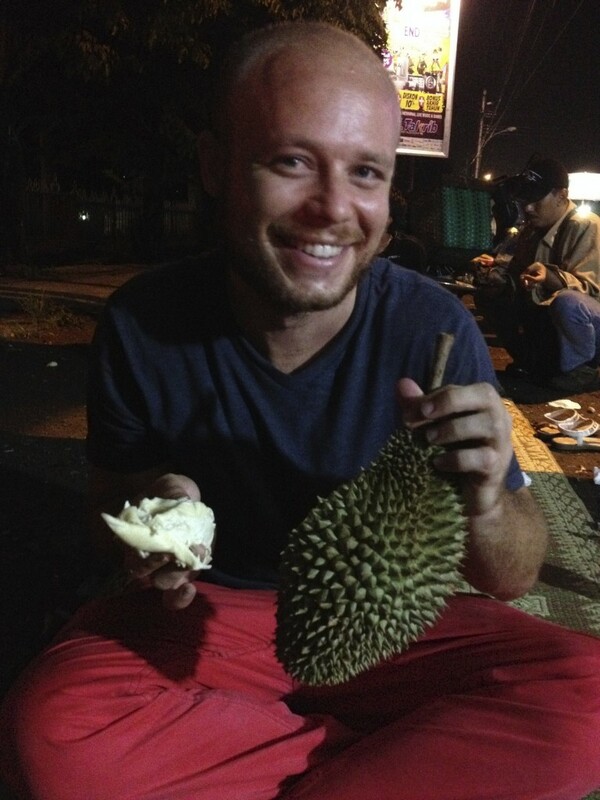 They don’t have the gene that makes one enjoy durian. I figured I would be the same after my first experience, and then I discovered something interesting. The second time I ate durian it wasn’t vomit-inducing. The third time it was lumayan (not bad, kind of good). The fourth time I tried it enak sekali (very delicious). The fruit is an acquired taste. If you stick with it you learn to love it. Magically you no longer sense the grossness of the smell, but rather the blossoming lurking behind it. You no longer taste the bitterness but the beautiful complexity of sweetness and nuttiness. 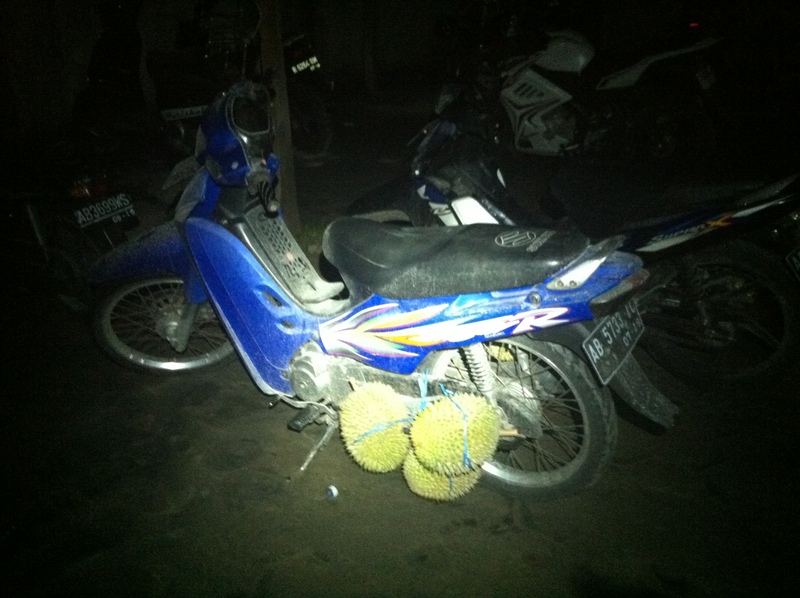 Taking home a few durian on my motorcycle. It is currently durian season here in Indonesia, which means the prices have come down and trucks packed with them line the sides of the roads. Usually we buy and eat them right there on the side of the road. Sometimes my Ibu brings them home and makes a chilled durian juice to be enjoyed as an after supper desert. I’m still trying to figure out if it’s possible to steal away a few seeds to plant when I get home. hey mr. brett! do u remember me? i LOVE that you are in indonesia. i read your article on living in “the now.” i loved it. im sorry about your family, but happy endings right? just one question, was it cool? the volcanoe, i mean. i imagine it, as everything goes quiet. and you just sit and watch. the lava spewing, but elegantly. besides all the panic, it seems serene and unreal. then that moment gets lost and you get torn back to reality. what was it like? Of course I remember you. How could I forget such an inquisitive and curious mind? I LOVE that I am in Indonesia too! Living here has really helped me to evolve my perception of the world and my place in it. I’m realizing how incredibly similar everyone in the world is. If you ever get the chance to travel, I highly recommend it. Your description of the volcano was beautiful. I love the characterization of the volcano being elegant. As much as it pains me to reveal this to you, I wasn’t actually in town the day the volcano erupted. I was taking my family around to see other parts of Indonesia and only got back to enjoy the choking ash clouds. However, I maintain that your description is how things went down. Say hello to your parents for me. I look forward to hearing of the incredible things you learn and discover. when are you thinking about settling down? when are you thinking about coming back to the U.S? (if of course this is in your life plan) and if you do come back and visit JTM, there is this one teacher I would like you to meet. her name is Ms. Siami, and she reminds me of you very much. That’s an excellent question that many people would like to know the answer to – probably my parents most of all :). When…? I’m not sure when I’ll settle down for good. I am enjoying this time when I have the ability and the opportunity to be a bit of a nomad. I may not always have that chance so I must do my best to seize it. I’ll be back in the US on June 18! So soon. I leave for Thailand tomorrow to enter a meditation retreat and monastery for a few weeks. I definitely plan to come back to visit JTM next school year. All my memories of long-haired 5th graders will be replaced by short-haired 8th graders. I can’t wait! I am looking forward to meeting Ms. Siami. What about her reminds you of me? As far as I’m concerned I am building skills and knowledge that will enable me to succeed in my future endeavors and most importantly to appreciate them. I personally believe that the days of “specific careers” are coming to a close. Of course, there will continue to be certain professions that follow this model, but more and more, I’m seeing businesses looking for people who have a wide array of skills and are willing to do any type of work. Companies need to be agile, to be able to change quickly, so they need people with a wide variety of experience. When I return to the US I will be getting back on board with a snowboard company that I started a few years back. I appreciate that your comments always have questions in them that make me think and process my experience.